Gentlemen of Leisure: X-aminations in January 2017...and Beyond! "X-Cutioner's Song" is looming, but for those of you looking forward to it, unfortunately it's going to have to wait, as I'm going to try a little experiment first (for those of you dreading "X-Cutioner's Song", well, you get a longer reprieve). This spring, my wife and I are planning on moving, which this time around, also involves selling our current house. That means we're looking at a bunch of annoying moving-related work on both ends in the months ahead (much of it has already started). Combine that with the fact that, once we do move, my internet service will likely be spotty for a few days, and the need to rebuild my backlog of posts is apparent (also making that need apparent: the number of posts recently going live well past the noon timestamp I give them...). Writing three X-aminations a week (plus a weekly Force in Focus, plus stuff like this), the only conceivable way for me to build up any kind of backlog is to take a break, but since I'm reluctant to go too long without ANY X-aminations posts (I've got quite a streak going), I'm going to do something a little different: Retro X-aminations. For five weeks starting at the end of January, I'm going to cut back to one post a week (on the original Wednesday release day), but instead of grinding the ongoing X-aminations to a crawl, I'm going to cover five stories I skipped the first time around, for whatever reason. Combine that with a solo post for the hilariously-90s "Capwolf" story on one end and a week covering only the Cable limited series and a strangely-bi-weekly issue of Excalibur at the other end, and I've got a solid seven weeks of light posting, during which I can once again write ahead and build up a backlog for the inevitable time shortages that will accompany the buying, selling, and moving into of a house (hopefully, this will also enable me to respond to comments more frequently, something I've been lax about of late but greatly miss). If you're mad that regular coverage is getting delayed even further, well, you can partially blame Fnord over at SuperMegaMonkey, whose own periodic breaks from his project helped convince me that I could do something like this without fear of losing my entire audience. And if you're excited by the prospect of retro X-aminations and there's something you think I should have covered but didn't, let me know. I have a list created that extends beyond these five selections, but I'm sure there's other things I'm missing. I can't promise I'll cover everything (there are some good reasons I skipped some things), but I do plan to periodically revisit the idea of retro reviews in the future, either in bulk like this, or the occasional one-off when I need a light week. So, with all that out of the way, here's a look at the next six months of X-aminations, as the X-books do their best to recover from the Image Exodus via "X-Cutioner's Song" (which also provides an opportunity to smoothly re-order which series are covered on which days of the week and in what order within a given month's releases), then begin the build-up to "Fatal Attractions" and their big 30th anniversary year, in which the already-large franchise will expand even more! You know what's crazy? It's going to take you roughly 7 months to get from UXM #293 to UXM #300 in your blog posts, the same amount of time it took the published books to get from 293 to 300. Not blaming you, of course, as there was a HUGE glut of X-related titles that will hold the main books up from being written about. I'm curious, how do you plan to handle things when you get to the 2000s and there are what feels like 100 X-titles coming out per month? Will you skip books? Do more posts per week? It's crazy how your blog went from 4 X-aminations per month to now only having each series reviewed one or twice per month due to the amount of X-related appearances out there. I'll definitely be a little more choosy when we get to the 2000s - I'm not planning on covering Deadpool's series, nor probably every Wolverine series, and I might skip some of the shorter-lived solo series that popped up around that time. Moving to four posts a week is also a possibility, but I'll probably hold off on that as long as possible. The upside is that as we move closer and closer to the modern era, the per-issue content decreases. I mean, a six issue story in the Jemas/Quesada era is roughly equivalent to one Claremont issue, in terms of stuff to write about, so even at four posts a week, the amount of writing I do may actually be less than it is now. We'll see. For the time being though, I'm sticking to three a week, and within the year (when CABLE launches, followed thereafter by GENERATION X), everything will shift into a three week rotation even before we get to the extra stuff like limited series, annuals, and the quarterly X-MEN UNLIMITED. Man, I completely forgot about Generation X! But kudos to you, you've been killing it for years. 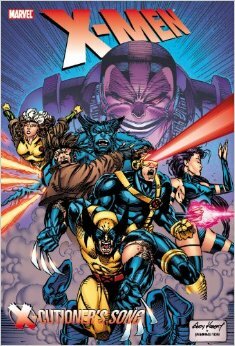 It also must be interesting to have read every single issue of X-Men and X-Men appearance up until 1991. I've always wanted to do this but never took the time. Thanks. It's definitely been interesting (and fun). I'd done a few full read-throughs in the past, when I was younger (and had more free time), but that was usually just the from the start of the "All New" days (the original 66 issues, outside the Kirby-drawn ones, were barely reprinted pre-2000), and never included EXCALIBUR & WOLVERINE until "Fatal Attractions" (which is when I initially started buying those series back in the day), nor a lot of the extra/ancillary stuff I covered here. So this has definitely been a different experience, getting (more or less) the whole picture from the start. You need a Patreon page, I feel like I spend a lot of time on your blog, it's something I look forward to each day and would gladly pay extra for this and for your time. I want to thank you for mentioning a bunch of silver age books a long time ago that the X-Men appeared in while the series was being reprinted, like the Hulk with Alex and Lorna and so forth. The Iron Fist issue they were in has shot up in value since you first mentioned it. It took me a while to track down the Captain America run that had Banshee and Professor X in it. Same with the Amazing Adventures issues with Hank. Here are some things I'd really like to see you cover when it's light weeks for you since these generally are shorter or you don't have to go as in depth. The Reavers appearance in Punisher. Revenge of the Living Monolith Marvel Graphic Novel which I believe is now considered the first appearance of Apocalypse and early work from one of our favorite X-Men artists. Marvel Holiday Specials - there were almost always an X-Men tale in them including the first issue of this having a tale by Cockrum set right before X-Men 100 where they fight the Brotherhood of Evil Mutants without Magneto before they go off into space and Santa makes them forget the fight. There are more X-Men related 8 page pieces in these. Maybe you could help me figure out how when all the Brotherhood was de-aged in Champions and yet all show up back to normal age and villainy. Magneto I get was worked on by Moira and age accelerated but how did Blog and the rest randomly show back up at adult age while the X-Men didn't age in the same time frame? The Marvel Super-Heroes seasonal book - this had a lot of X-Men stories in it including a 3 parter and a really good story on Magik. Marvel Valentine and the I heart Marvel X-Men one shot. These are in the future of what you are covering but you could get there. The Classic X-Men backup stories, at 8 or so pages each, should make for a shorter review and reading but would be great for fill ins on the blog. Of course, these are just suggestions. You have helped me find X-Men stories from the Silver Age that I otherwise would not have known about and maybe these will help someone else find rare stories they didn't know about. I've gone back and forth on doing a Patreon; it's been mentioned by others before, but I've been reluctant just because I feel like to really justify a Patreon, you want to offer some kind of exclusive material to the subscribers (like the "Weekend Edition" of popular podcast Patreons), and I don't really have the time to generate more content (plus, as someone who wants to grow his audience - as opposed to someone with a large following already in place - the hiding of hiding a portion of my writing behind a paywall seems counter-intuitive). Plus, there's also my vain and outlandish hope to turn this project into some kind of eBook (or series of such), which remains difficult even as a self-publishing project simply because of how critical images are to my reviews. I did not know this existed; definitely something to put on the list, it might be especially relevant to cover circa "The Twelve". Maybe you could help me figure out how when all the Brotherhood was de-aged in Champions and yet all show up back to normal age and villainy. The Brotherhood (along w/Magneto) was de-aged in DEFENDERS #16. Shi'ar agent Erik the Red then re-aged Magento in X-MEN #104, and the rest of the Brotherhood from DEFENDERS #16 next appeared fully aged in CHAMPIONS #17. The official explanation is that Erik the Red's process was also applied to them (via spillover, roughly), though I'm not sure if that was directly established in CHAMPIONS or smoothed over later via something a letters page or something like the MARVEL HANDBOOK. I initially resisted doing these mostly because Jason Powell reviewed them so well during his Claremont retrospective over on Remarkable that I didn't think I could add much, but they might be worth revisiting and writing about in some form (maybe in batches, if not story-by-story) some day. Definitely something to think about. Was this Kubert image a promo for the event? Wasn't Apocalypse believed dead after X-Factor 68? This would be a huge spoiler. It was a cover to X-Men 14 (I think) and it was already revealed he was in a healing chamber with the Riders of the Storm watching over him. Maybe their name had been changed to the Dark Riders by then. Yeah, it was an X-MEN cover during the story. I don't believe it was ever used as a promo image prior to the story's release (now, it's used as the cover for one of the reprint editions, which is where this specific image came from). I'm anxious to read your Stryfe's Strike Files #1's review, since that issue wasn't published here in Brasil. Not to curb your enthusiasm, but just in case you don't already know, it's more of a handbook-style issue, with biographical entries on various characters, moreso than an actual story. But it does have a brief framing sequence, some interesting character insights, and actually marks the first appearance (in prototype form) of a couple future characters, so I'm giving it a post. Oh, yes, I know it's a handbook-style issue. Something like Apocalypse's thoughts about X-Factor, I think. And there was another one like that during the Onslaught crossover too, right? By the way, are you planning to rewiew X-Men 2099? I finally bought all the Brazilian issues together with Spider-Man 2099 and the others 2099 super-heroes (Hulk, Ghost Rider etc.). I know Onslaught had a "Road to Onslaught" oneshot, which was basically a text piece saying "here's what the story was originally going to be until it got changed by various forces" (PS - the story sounds a lot better than what was printed), but I don't remember if it had a Handbook/Strike Files issue too. A. There's plenty of books already to cover, with more on the way, and I don't want to slow down forward progress more than I have to. Actually, I was refering to Stryfe's Strike Files #1 itself, not to another Handbook. I think I wrote it badly, sorry. I'm weirdly excited about Giant-Size FF #4, MTU #65-66, and Bizarre Adventures #27 (the latter of which I just acquired and am also oddly excited about). I'm actually really excited about most of these retro reviews as well; in most cases, I haven't ever read any of the issues before (just the Wolverine first app and one of the BIZARRE ADVENTURES stories). Both MTU #69 and Annual #1 (along w/the wrap-up in #53, and Karma's first appearance in #100)) are on my "future retro X-amainations" list; I'll have to check out the others (and #149, Cannonball, is another option). There's always the full run of Dazzler.